Radiation Therapy began with a pre-treatment CT Scan, which occurred on Friday, May 15th. The results of the scan were used to determine her radiation treatment plan. She will take 16 treatments. After they conclude, she’ll begin her chemotherapy. MJ may not eat breakfast, but she does receive her morning medication at home before hitting the road. We drop her off between 7am and 9am during the weekdays for treatments. She will not have sessions over the weekends or on holidays. We sign an anesthesia release form and provide an update on her meds and how she’s doing/any changes each morning. They call us when she’s waking up with a time after which we can pick her up. She’s becoming a staff favorite, and they’ve set aside a kennel to be her “house” for the duration of her therapy. 6/11, Day 16- LAST DAY! That’s all she wrote for radiation! I can’t believe she’s done. In 7-10 days, we’ll go back for a check-up, and then we’ll start discussing chemotherapy. MJ did have a moment when her IV was removed today, and she has a huge hematoma on her back right leg, which will heal with no issues. The vet tech called it a hematomato. We like her. Tomorrow is our last radiation treatment. We’ll have a consultation with the doctor about beginning MJ’s chemo. The adventure continues! After today, only four more radiation treatments! We noticed today that three of her new sutures are blue. Two are black. There’s really nothing more to say. Today, we gave her a neck, down bath. She smells better. Trust me. Her head still weeps, but the doctors are pleased with how the wound is starting to fuse. The antibiotics are doing their job on the swelling, and the new sutures are holding strong. This begins Week 8 of MJ in a cone. 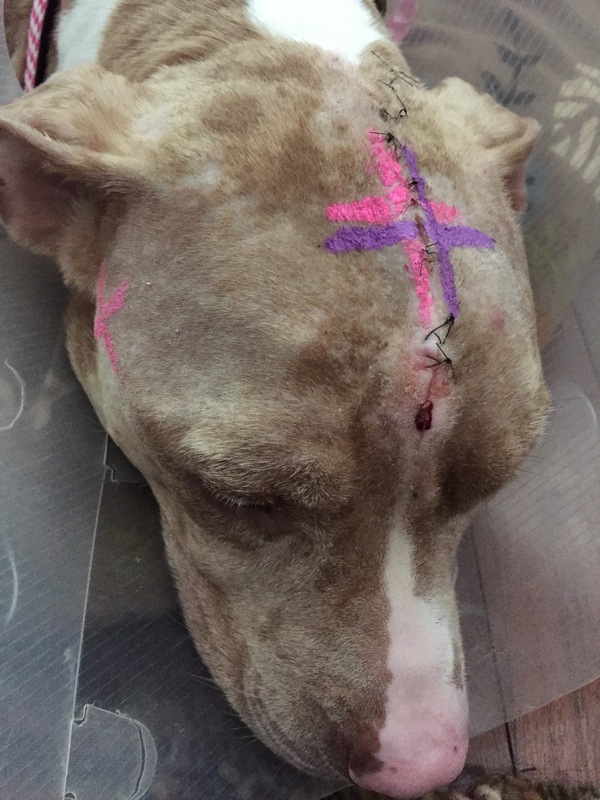 The swelling along her incision is suspected to be some form of infection. While under sedation today, her medical team reopened her wound to clean it and take a sample to be cultured. So… new stitches. The saga of the cone continues. We’ve noticed some mild swelling along her incision, where the linear accelerator lines up. This is to be expected, and her sutures appear to be holding things together. No loopiness to speak of and no seizures. We’ve gotten a hand on how frequently we need to run her out post-treatments. Much better today with accidents, and almost no residual loopiness from the anesthesia. No seizures. 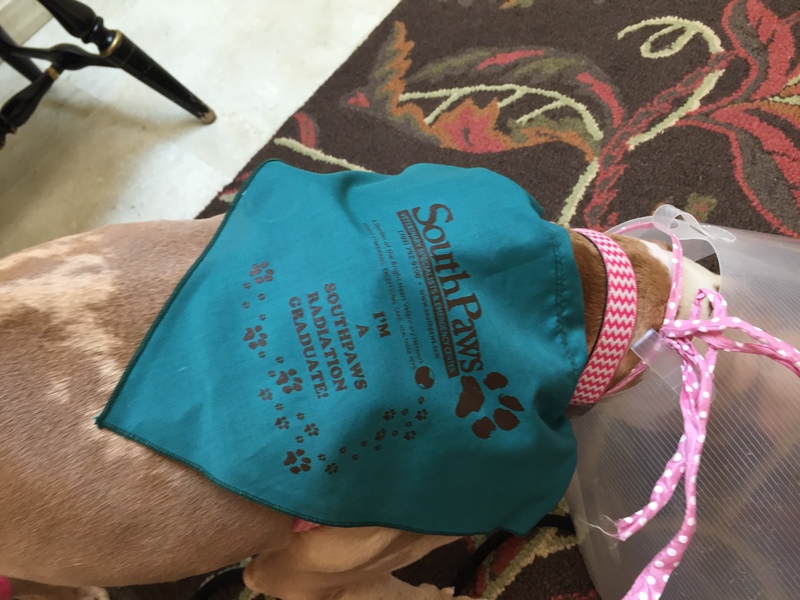 More accidents today, but less loopiness from the anesthesia– she was able to let us know she needed to go out. No seizures, but still knuckling and now with both front feet. She’s had a few accidents after coming home today, due to increased water consumption. We’ll get on a better routine for getting her out for pit-stops. No seizures, but she is knuckling. She had some bleeding from her incision.